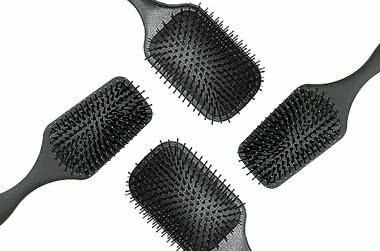 Authorised stockist of Denman Brushes, the range that hairdressers use. Showing 20 products of 22. I have not bought a hairbrush for a while as I have used tangle teesers for years but just not getting to the scalp as I’d like.I have long hair that’s wavy.This does the job,feels lovely great to hold and I love the size for travel.I also use it on my 2 1/2 year olds hair.I would definitely buy another Denman brush! Before purchasing I went to Priceline to feel a similar looking brush and I'm so glad I opted to order from AdoreBeauty. Though it's a bit pricier, the quality difference is soo noticeable. The bristles are sturdy and feel like they will last a long time. I was a little hesitant about spending so much on a hair brush but I took the chance and it is so worth the money! My hair is long, thick and wavy and after having a shower this brush detangled my hair in one effortless brush, so quick and easy, very happy.